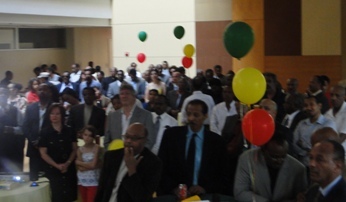 The 19th anniversary of the downfall of the brutal military junta and the dawn of a new era of peace, democracy and development in Ethiopia was colorfully celebrated at the premises of the Ethiopian Embassy in Washington DC last Saturday, May 29, 2010. The historic day was commemorated on the morrow of the 4th Ethiopian unhampered continuation of the progress of peace, development and democracy by decisively voting for the EPRDF and entrusting it with bounden and huge task of an all-round revitalization and nation-building through its renewal and renaissance venture it has charted out since the on-set of the new millennium. His Excellency Mr.Tesfaye Yilma, Charge d'affaires of the Ethiopian Embassy underlined the significance of the event as ushering in a higher vista and a leap to a new venue for the Ethiopian people to exercise their hard won democratic and human rights enshrined and protected by the Ethiopian constitution. Mr. Tesfaye furthermore underscored that, the kernel of the Ethiopian constitution, lies in that it dealt a crushing death-blow to the hollow notion of supra-national identity imposed by preceding unjust polities and implanted in its place the true identity, history and culture of all nations, nationalities and peoples of Ethiopia based on equality and justice and a genuine recognition and acceptance of their struggle for self-actualization, under the motto, of unity in diversity. The Charge d'affaires on the occasion reminisced, the prevailing strong bi-lateral ties between Ethiopia and the US which have continued for over a century based on mutual respect, and partnership. 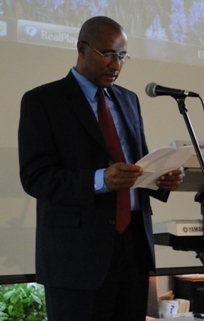 As pertains to the need for an active engagement of the Ethiopian Diaspora in injecting their share in the on-going national drive, he urged them to diligently move forward in promoting and safeguarding the national interest and to continue playing a constructive role to bolster the march of the Ethiopian people to extricate the nation from backwardness and grinding poverty and realize its true place as one of the middle income countries in the not too distant future. Representatives from the Alliance of Ethiopian Civic Associations in North America and the Eritrean community in the Diaspora pledged their support for the effort of the people and government of Ethiopia by expressing their messages of solidarity and congratulations. A cultural musical troupe played traditional songs of the various nations and nationalities of Ethiopia on the event which was accompanied by entertainment and a gala dinner served on the occasion. The event was amazingly graced when the National Anthems of Ethiopia and the United States of America accentuated by the two countries' National Flags were played animate the packed audience of members of the Ethiopian Diaspora and invited dignitaries.